A father-son architectural duo experiment with a compact, modular home with flexible furniture arrangements. 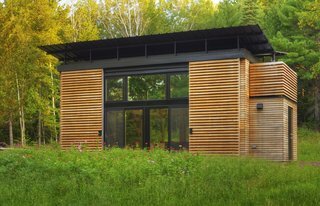 Foraying into small space architecture with an aim of helping to alleviate the housing market, Bill Yudchitz of Revelations Architects and his son Daniel Yudchitz built this 325-square-foot retreat, the Experimental Dwelling for a Greener Environment—or simply EDGE for short. In September 2009, Bill and Daniel Yudchitz bought a 2.78-acre lot that had water access to Lake Superior’s Chequamegon Bay. 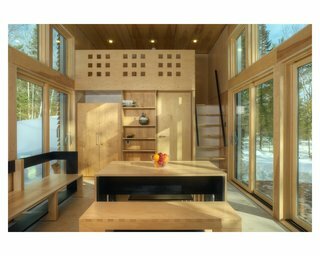 Many of the properties they looked at required a larger minimum building footprint than they desired; their cabin needed to be small to reduce its environmental impact. Their design took four months to construct. 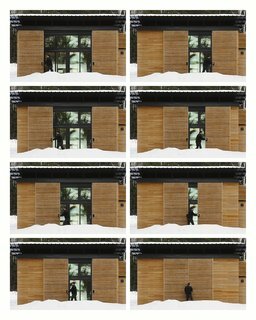 And much like their later project on the same property, the Nest, the EDGE cabin features a protective, movable screen: when not in use, these white oak panels slide inwards to shield the cabin windows and doors. Inspired by Swiss Pritzker Prize-winning architect Peter Zumthor, the Yudchitzes designed and crafted an exquisitely precise interior. As they report, "It cost at least $100,000 to build because the materials were crafted to within .002 inches, so it’s expensive for what it is." 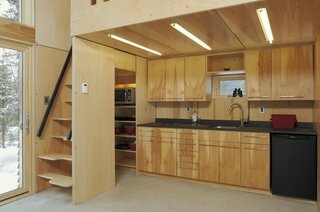 While there are two sleeping lofts—one above the kitchen, the other above the bathroom—the EDGE Cabin's multifunctional furniture can add a third bed. This is accomplished using the table in the main living room. Seen here, it's arranged to act as a standard dining surface. 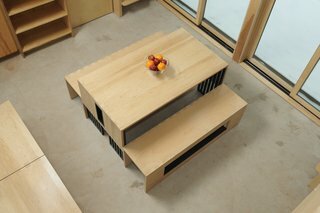 It quickly becomes a coffee table when its legs are folded inwards and hidden underneath the tabletop. 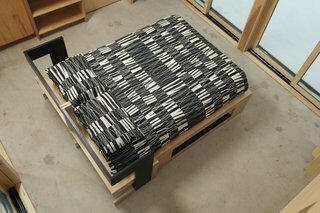 And of course, when specially arranged and with the help of a headboard, the table(s) become a third sleeping area. Starting in July 2013, the Yudchitzes built an even smaller—and more simply crafted—cabin just 130 feet from this project. They built the new dwelling using materials leftover from other projects, thereby reducing its cost dramatically.